Nervous system-The rose water has very soothing effect on nerves, emotional and psychological state of mind. It is used in giving relief to mental tensions. In aromatherapy it is widely used to normalize many of mind powers. Digestive system- It has been widely used for therapeutically for digestive problems and circulation. Rose hip tea (swollen bud for seed formation is crushed and boiled with distilled water for 10 minutes and strain it. Add in to it honey and drink it) is excellent for diarrhea. Beneficial for the skin- It helps in the purification and cleansing of skin. 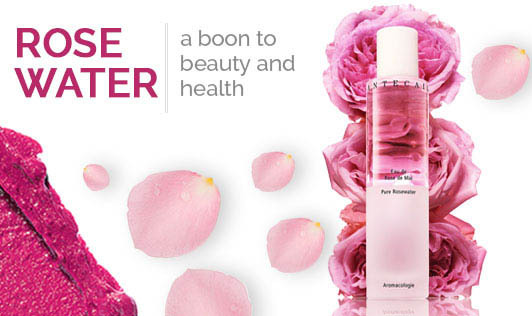 Rose water on skin balances the oil contents, tones the skin, cools and soothes it. It helps in healing wounds and sunburns. It can also be applied as an aftershave to soothe burning and irritated skin. Beneficial for the hair- Regular application of rose water takes good care of scalp and hair. It helps to reduce inflammations, increases blood supply in the scalp and promotes hair growth. Relaxation from stress and fatigue- Addition of rose water to bathing water relieves fatigue, produces a relaxing effect, and improves mood in conditions of stress and depression. Healing properties- Rose water also has healing properties and is suitable for rinsing in conditions of sore throat. A cotton ball soaked in rose water can also be used for treating inflamed glands. Benefits to the teeth- Regular use of rose water helps in relieving and curing paining gums, strengthening of loose teeth and removes bad odor from the mouth. Relieves headache- Apply a cold compress of rose water for approximately 45 minutes to relieve headache. Rose water is easily available in the market. Use it and get the best of it! !